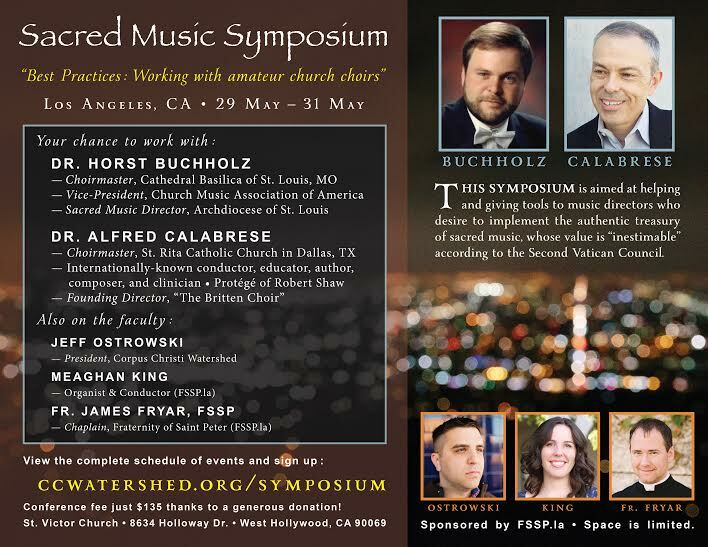 Corpus Christi Watershed has announced the first details of their Sacred Music Symposium. Subtitled Best Practices: Working with Amateur Church Choirs, the symposium is aimed at choir directors who are looking for help in introducing traditional music to choirs and congregations. It takes place in Los Angeles at the end of May. 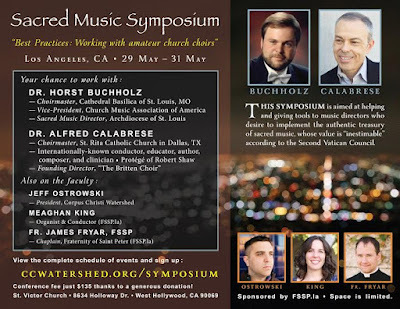 Named teachers, as you can see on the poster below are: Dr Horst Buchholz, Dr Alfred Calabrese, Jeff Ostrowski, Meaghan King and Fr James Fryar of the FSSP. Dr Calabrese will be having a busy May! The previous weekend in Dallas he is organizing a conference at his parish in Dallas, Texas, St Rita’s, on beauty and the liturgy, which will culminate in the world premiere of Catholic composer Frank La Rocca’s new oratorio, A Rose in Winter on the life of St Rita.